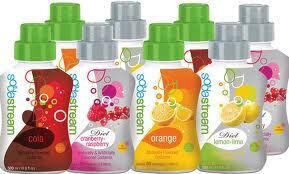 Soda Stream is the #1 soda manufacturer in the world. Seriously! They are made in Israel, so Europeans have been hip to these for decades, leaving Coke and Pepsi at #2 and #3. It’s a pretty simple concept; a machine that makes regular tap water fizzy using a carbon dioxide canister. You fill the bottle with water, connect it to the machine, push a button, and twenty seconds later you have carbonated water with no mess. Depending on your preferences, you can choose to make it more or less fizzy. 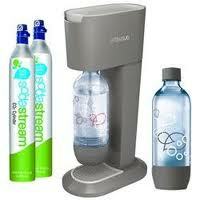 Sparkling water has amazing health benefits, so a lot of people buy the Soda Stream just for cheaper fizzy water. That stuff can get expensive! 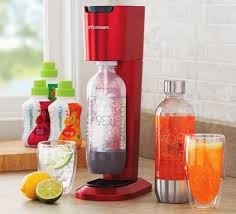 If you want to, you can opt to purchase soda or flavor mixers for the fizzy water. The price tag can seem high, but one bottle goes a long way. They estimate with their soda mixes that it’s about 33 cans of soda per bottle, so not a bad deal! Depending on the flavors, a lot of them don’t contain high fructose corn syrup or aspartame, which can make this a healthy alternative to regular soda drinking. They also sell essences to lightly flavor the water. You can also make your own mixes or buy from a third-party. The main difference between the machines is if they use glass or plastic bottles. If they take glass, they have a different connecting mechanism and they cost a little bit more. Beyond that, the only real difference between the various machines is aesthetics, so a higher price tag generally means it has more metal on it than plastic. However, some of the machines also vary in that they can hold a larger CO2 canister. The regular size is 60L and the larger size is 130L. The 130L machine should be able to take either size, but always double check the instruction manual! Stores that sell the canisters will sell a brand new canister at full price, but will also usually have an exchange program where you recycle the old canister and get the new one at a reduced cost. You get the reduced cost for exchange no matter which size you are returning, and even if the store doesn’t sell the larger size, they will be able to recycle it for you. The store I worked at didn’t sell the larger machines, but demand for the larger canisters became so high that they started to carry them anyway, so always ask! Not all retailers that sell Soda Stream machines carry spare CO2 canisters, or even accessories, so check before purchasing. Stores that specialize in kitchen and home goods are generally going to be a better bet to find this service, and you can also find them online at various sites. Soda Stream has a “Where to Buy” link on their page, as well. 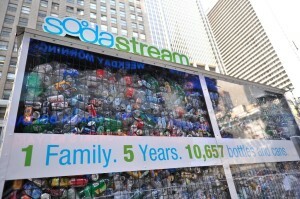 The plastic bottles that Soda Stream makes are BPA free and dishwasher safe (so are the glass!). They even make smaller bottles that have a special base so that they fit into a cup holder more easily. It’s also very easy to purchase replacement caps on their website. One benefit I noticed in using their bottles is that the soda seems to stay fizzy longer than a regular bottle of soda purchased from the store. Technically the Soda Stream is environmentally friendly because not only are you saving yourself some money by not buying all those bottles of water or soda, but that means they didn’t have to manufacture that many more bottles, too. You’re not supposed to reuse regular plastic bottles because of BPAs, so this is a great way to be greener. Some folks will try to cut the price tag a little bit by going for a seltzer maker (soda siphon). The cheapest Soda Stream right now is going to be about $100, and you can get a nice soda siphon for around $70. Isi and Liss are the two most popular brands. These don’t quite fizz the water the way a Soda Stream does, so generally the only people purchasing these are using them in their home bars. They were always returned, so I started asking everyone what they were using it for first! Believe me, we probably sold a couple each year company-wide, then the Soda Stream got popular and all of a sudden we started “selling” more—and returning more! They are a great product if that’s what you want; just don’t buy in lieu of the Soda Stream. Gifting caution – The Soda Stream machines all come with CO2, which cannot be carried on an airplane, so if you are giving or receiving this as a gift when traveling, be prepared to be stopped. Think fast; don’t leave the whole unit behind, simply remove the CO2 canister and you should be able to take the machine with you. It’s probably not a bad idea to see if there is a store that sells the canisters near the person you’re gifting, as well. PS If you did somehow sneak it past security, the CO2 won’t work anyway once you land! The whole concept is pretty neat! It’s pretty great if you’re a soda or fizzy water enthusiast, for sure! Save yourself some money and eliminate some of the bad stuff in the store-bought brands!